Moog (NYSE: MOG.A and MOG.B) — a designer and manufacturer of high performance motion control products, solutions, and services — has launched a new version of its cartridge cover series with a compact design to create simple pilot-operated pressure relief functions. Moog designed its Cartridge Valve Covers for the 2-way Slip-in Cartridge Valves (CEE) series, and these offer the highest nominal flows and lowest pressure drops currently available on the market. The rated pressure of the covers is up to 420 bar (6,000 psi), depending on cover type and the seal material used. The Cartridge Covers series now includes two new sizes, 125 and 160, which Moog have standardized as stipulated by the latest ISO 7368 standard. Moog’s two new cover variants include a DBA cover that uses an integrated pressure relief valve to create simple pilot operated pressure relief functions, and a DBD cover with integrated pilot valve interface, for more complex functions. Customers can use the new covers for directional, flow and pressure control functions across all sizes. They can be combined with the majority of Moog 2-way Slip-in Cartridge Valves (CEE, CKE and CEHFE series), and function with integrated check and shuttle valves, together with interfaces for subplate pilot valves. The new DBA and DBD Cartridge Covers feature an integrated screw-in pressure relief pilot valve, rendering them easier to handle than previous solutions. Customers from the metal forming and presses sector will benefit from the Cartridge Cover’s high load capability, even in extreme environments. 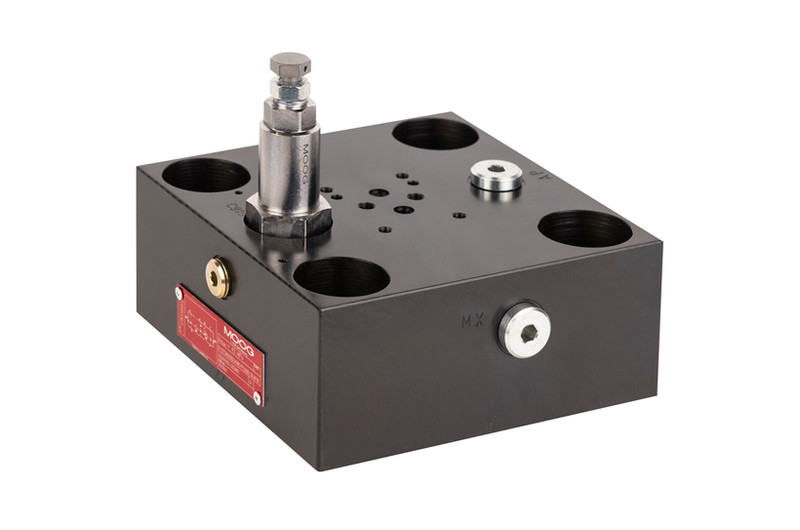 They also offer a wide selection of available functions for maximum flexibility in manifold design, and are easier to order and handle than previous versions. Overall, there are more options available for the customization of eventual systems, and the new covers’ smaller space requirements can reduce customer costs.